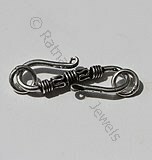 Ratnasagar Jewels offer a wide range of high-quality silver jewelry clasps, which ideal for necklaces, bracelets, earrings, other kinds of jewelry making projects. 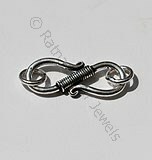 We manufacture a great collection of silver clasps which can be used to leave a professional touch to your preloved jewelry. 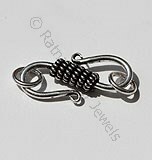 One of the most talked about and hottest trend today in the jewelry industry is to put a toggled clasp to a hefty silver charm. 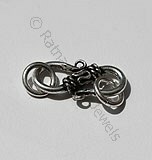 With our highly polished Silver Claps, available in myriad designs, you may feature stunning granulation or twisting wire designs around your necklace or bracelet. 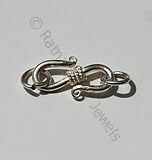 Poised with a shiny finish and oxidized polish, our silver jewelry clasps can explicitly enhance the grandeur of any ornament. 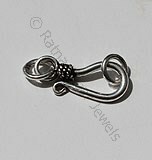 The inside of our silver jewelry clasps has a beautiful bead with a silicone core that enables easy adjustment to secure jewelry to your desired length. 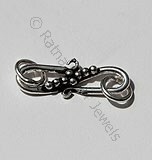 Discover our entire range of sterling silver clasps and much more today at www.ratnasagarjewels.com.